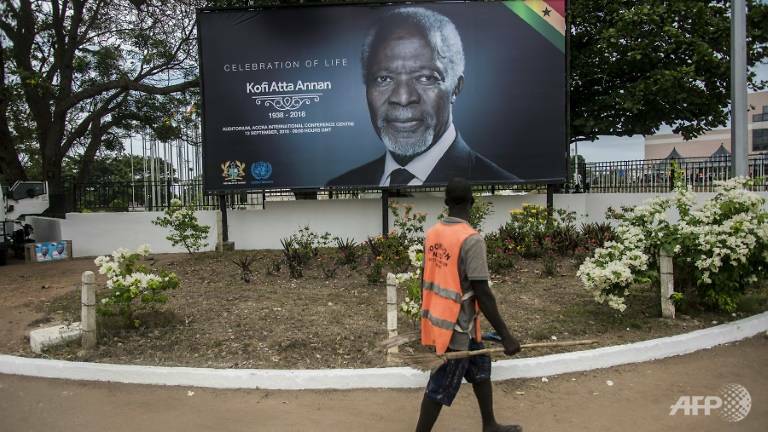 Former UN secretary general Kofi Annan will be buried in his native Ghana on Thursday (Sep 13) after a state funeral attended by world leaders past and present, traditional rulers and global royalty. The ceremony at the Accra International Conference Centre, which starts at 8.30 am (4.30pm Singapore time), marks the end of three days of national mourning for the respected diplomat. Annan led the UN from 1997 to 2006 and was the first from sub-Saharan Africa to do so. He died on Aug 18 aged 80 at his home in Switzerland after a short illness. Annan had taught him "the benefit of humility, the benefit of honesty, the benefit of decisiveness, and diplomacy from the grassroots," he said. Annan was awarded the Nobel Peace Prize in 2001, as the world was reeling from the Sep 11 terror attacks in the United States, jointly with the UN "for their work for a better organised and more peaceful world".